During my last DMVPN: Advanced And Crazy Scenarios webinar (register here), one of the students mentioned the need for non-unique NHRP registrations in environments where the public IP address of a DMVPN spoke site changes due to DHCP lease expiration or PPPoE session termination. Finally I found some time to recreate the scenario in my DMVPN lab; here are the results. Next-Hop Resolution Protocol (NHRP) was designed for large layer-2 switched network environments (example: ATM networks with SVC support). 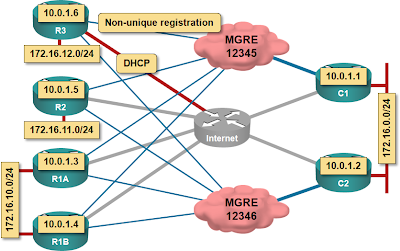 In those environments, the layer-2 address of a site never changes and thus NHRP clients uses unique registrations by default; the mapping between IP address (protocol address in terms of RFC 2332) and underlying layer-2 address (RFC 2332: NBMA address) is not supposed to change. 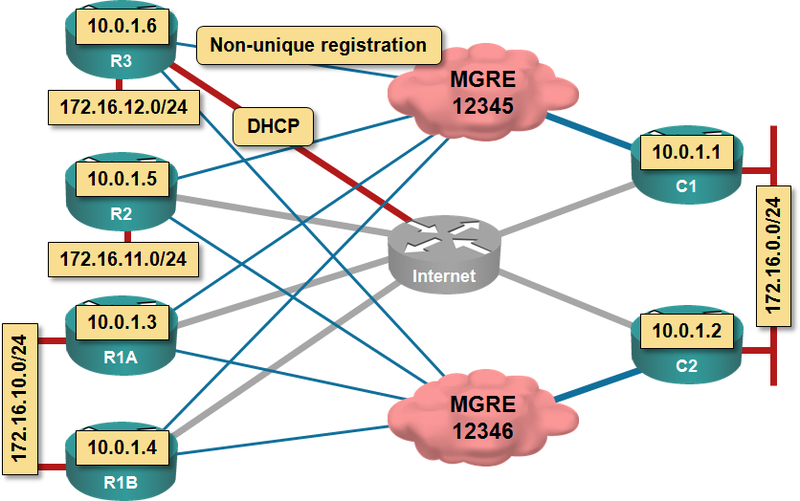 NHRP clients set the uniqueness bit in the registration packets and Next-Hop Server (NHS) subsequently refuses all registration packets that try to set a different NBMA address for an already-known protocol address. In DMVPN world, protocol address is tunnel interface’s IP address and NBMA address is the IP address of the tunnel source (usually the outside – Internet-facing – interface). The tunnel interface flaps when the IP address on the outside interface changes, triggering NHRP registration request, but the registration requests are rejected by the NHS until the old registration expires (registration hold time is set by the client and configured with the ip nhrp holdtime interface configuration command). You can fine-tune steps 1-3 on the spoke router; step 4 sometime requires coordinated changes throughout the network. Non-unique registrations are just one of many DMVPN features covered in the DMVPN: Advanced And Crazy Scenarios webinar (register here). I’ve also added a new lab topology that allows you to test the impact of non-unique registrations on recovery time to the set of router configurations. Attendees of the previous DMVPN webinars will get access to the new recording and expanded router configurations after the next webinar. But usually, you would get the same IP address back after DHCP lease expiration or PPPoE session restart. I have always seen a static IP address from the SP to the clients. Nonetheless, non-unique keyword is a good trick. And as u mentioned, it will still stuff up IPSec and routing. "you would get the same IP address back"
Apparently not in some networks. Someone working in a major European country told me their spoke site addresses change every night. Just to agree with what Ivan said. Unless I have asked for a static IP address assignment (and pay a monthly subscription fee for that service) I will get a new IP addresses in most cases if I disconnect my PPPoE (over xDSL) and reconnect again. IOS dhcp client will have a default route to the default gateway provided by dhcp server. Amazingly, this behavior is still true even you are using a front vrf which you put the WAN interface to a vrf and make it as dhcp client also. It will install a default route to the default gateway in the vrf RT. I just tested it in a CISCO ISR 881 spoke and CISCO ISR 871 as hub. All are good and working as expected. In another example of parallel thinking processes, I did exactly the same thing (DHCP-based route in VRF) two days ago when developing configs for my Enterprise MPLS/VPN webinar and was as surprised as you were to see it work flawlessly. So we have to enter the ip nhrp registration non-unique only on the Spokes? I typed tunnel protection ipsec profile SPOKES shared on the HUB, as you can see. Do I really have to add this command (shared) when I have multiple Spoke routers? Do I have to add something on the tunnel in order to optimize the DMVPN cloud? The spokes have dynamic IPs (PPPoE). "ip nhrp registration non-unique" is required on the NHRP client, not on NHS.